My corner of North Carolina is experiencing a long, wet, cool Spring. 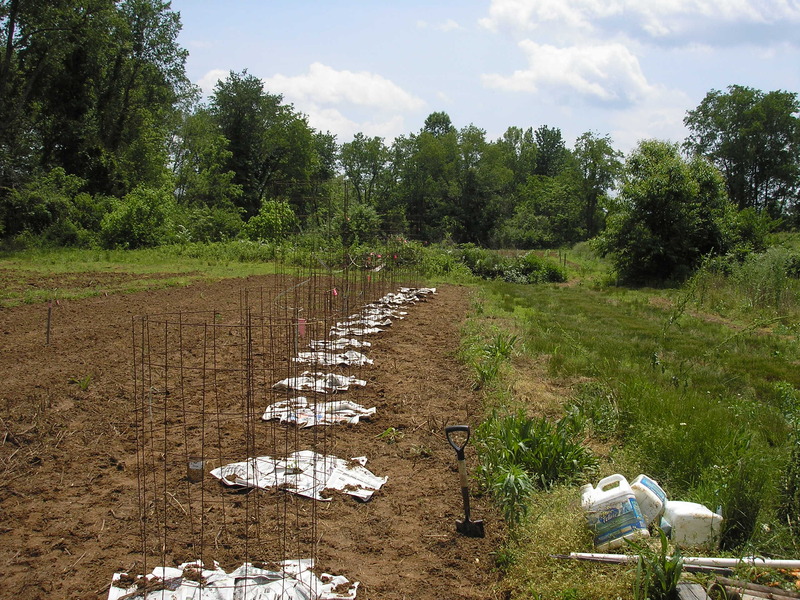 Frequent rain showers and sometimes below-freezing night temperatures slowed my planting for this season and this past Tuesday, May 21st, was the first day I dared to take the first tomato plants to the farm. All my tomato plants are heirlooms, started from seed at my home and I treat them as the “babies” they are from seed to seedling. With only a chance of afternoon showers and a dry weekend forecast, it looked as if Tuesday would be a good day to begin the transplanting process. 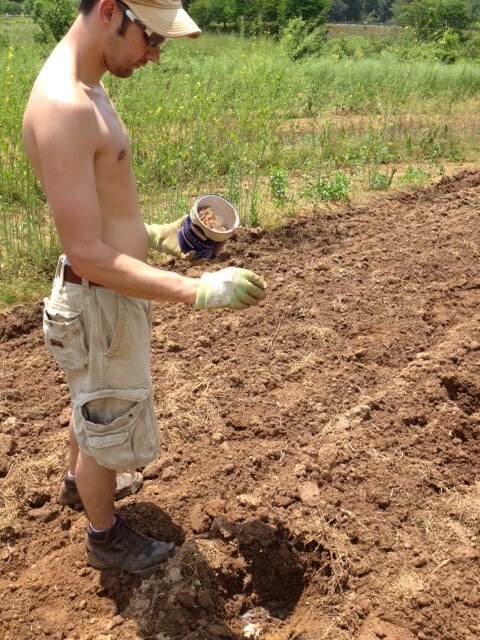 Plus, it was a favorable planting day, according to the lunar calendar. Luckily, I had help from my son, Clark, (www.heirloomrestaurantnc.com) and we quickly set to work in the areas designated for this year’s tomato plants. 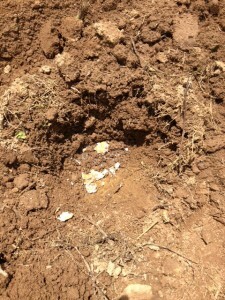 Clark and I dug holes and placed a cocktail in each: about 1 tablespoon of Epsom salts, for a dose of magnesium, a good pinch of organic bone meal for phosphorus, a small handful of eggshells for calcium and a spade of compost for a wealth of nutrients. (Note: I saved eggshells since last year’s planting season and they are all from happy, local chickens. After a quick rinse, I allow them to dry and then crush them and save them in recycled containers with lids.) With all ingredients in the hole, I work them together with my hands, just as you might knead bread dough. Adding soil to the cocktail, I then place the tomato plant as deeply as possible and fill in garden soil until the plant’s leaves are just above the ground level. Clark and I placed thick layers of newspaper around each plant and then added a wire cage to contain the growing plant. Finally, I fold duct tape (I only use ShurTape, manufactured in NC!) around one of the wires and use a permanent marker to label the enclosed plant. Tomato planting is time-consuming labor, but Clark and I proudly looked over the thirty-two new farm residents and planned for Wednesday’s planting. On Wednesday, our work seemed to go a bit faster, probably because threatening clouds moved in as the afternoon progressed. We completed the row we began yesterday, bringing our total to forty-six and started a new one. Clark dug 28 holes and worked as quickly as possible to add the cocktail mixture. The wind picked up and newspapers began to fly across the fields, costing us valuable minutes as we ran to retrieve them. When the rain started, I scurried to the truck and loaded all our tools, etc., in the back as Clark finished placing newspapers around the last tomatoes in the row. We jumped into the truck, drenched to the skin, just as a powerful thunderstorm unleashed its fury. Rain dripped steadily from my hat and I quickly removed it to stop the inside shower. As we drove away, straining our eyes to see through the windshield that rapidly moving wipers could not clear, we crossed our fingers and hoped our plants would be spared the worst of the storm’s wrath. Ten miles away, at our home, the storm continued to rage all through the evening. At one point, I saw small hailstones falling on my deck and I prayed the tomato plants would not be beaten by an assault. Thursday dawned cloudy and downed tree limbs and debris were reminders of the storm. By afternoon, the skies cleared and Clark and I decided to drive to the farm and inspect the damage. 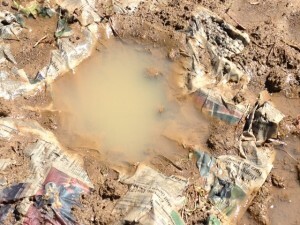 Donning my knee-high rubber boots, I made my way through mud that was so deep and thick, it threatened to pull me to the ground. Not since 2008 has Heart & Sole Gardens been so mired in mud or had so much standing water. Last year’s spring flood, which caused us to lose our pea crop, some tomato plants and a lot of potatoes, did not compare to this deluge. 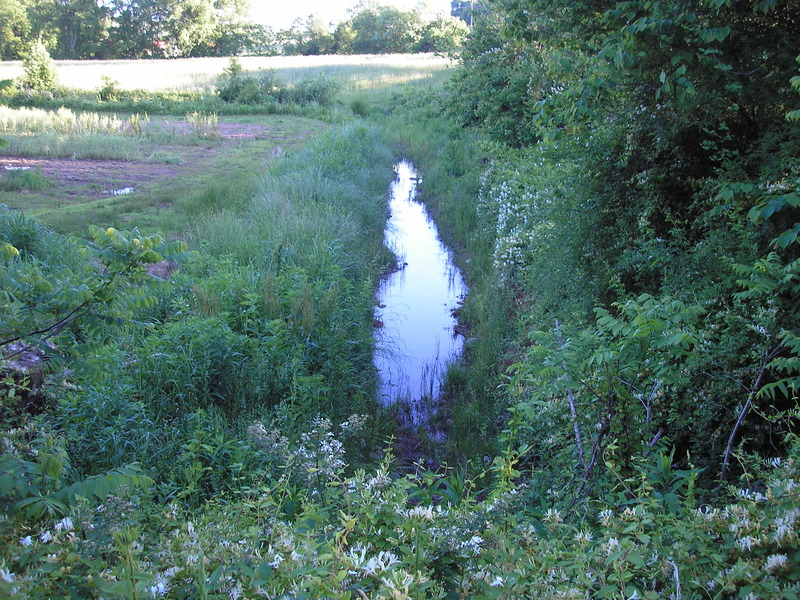 Compounding the problem is a drainage ditch, constructed by our state workers, that borders our property. DOT workers spent hours last summer working to trench the ditch in an attempt to resolve water runoff issues caused by a highway, but since they failed to use tools that would have helped them direct the water flow in the correct direction, it now stands, stagnant and pondlike, making a perfect breeding ground for mosquitoes. While Clark and I struggled to walk through the deep mud, these pests descended upon us. 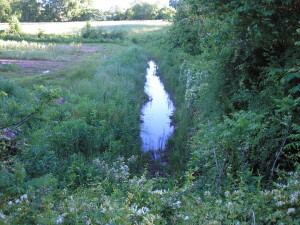 According to the state official who inspected the work, eventually enough silt will collect in this “pond” and cause the water to flow toward a small creek. After the effects of this storm, I doubt that “correction” will happen in my lifetime. Meanwhile, our farm is forced to deal with the effects of a poorly executed job. Incorrectly constructed drainage ditch, courtesy of NCDOT. When I finally came close enough to look for the newly planted tomatoes, I had to pause to mourn those completely submerged in water. Not a single leaf was visible in the murky water. Saddened, I left to cut asparagus and thankfully, that perennial bed is in an area that, so far, has not been flooded. Today’s bright sunshine and brisk breezes will help to dry the farm, but I am afraid we will lose many of the seventy-four babies we so carefully planted; therefore, I am planning to replace lost plants with others from the greenhouse. 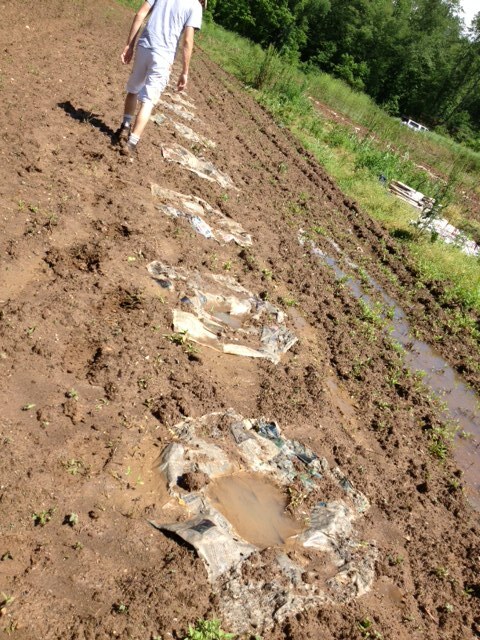 A row of drowned tomatoes, just planted the day before. 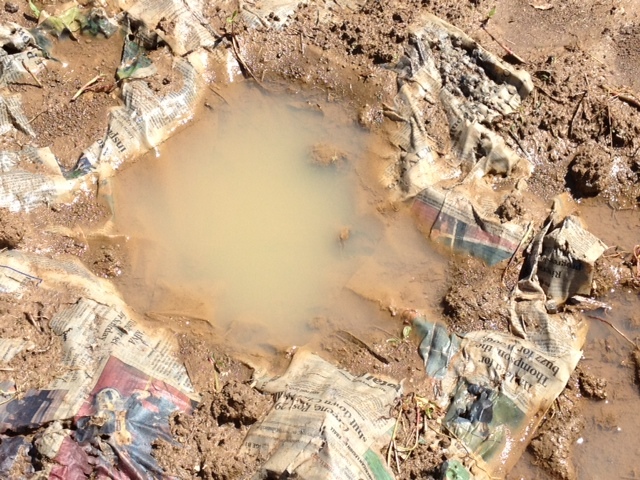 Somewhere, under that water, is an heirloom tomato plant. 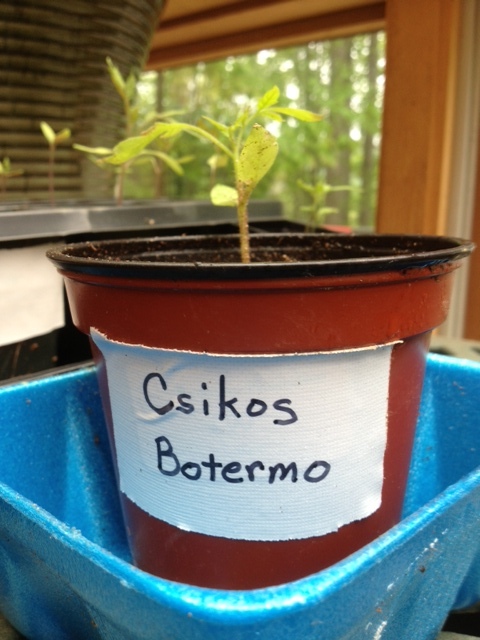 Fingers are crossed for heirloom tomatoes this summer. Some of last year’s tomato harvest. This entry was posted in Heirloom Seeds on May 25, 2013 by cindybarlowe. Tomato planting is just around the corner in my North Carolina area and I am looking forward to putting my “babies” in the ground. I am far behind the past few years’ planting schedule, but a long, cool, wet Spring has slowed my steps and the 2008 season is still fresh in my memory. The cool, wet days of that year led to a blight that wiped out our 150+ tomato plants and I am just not ready to take the chance of losing my tender seedlings to Mother Nature’s unpredictable weather pattern. Every plant in my greenhouse was started from seed and some of them look pretty fragile, but warm sunshine and just the right amount of rain will give them a needed boost and they will catch up with those department store plants I have grudgingly admired. Although I am tempted to buy a plant that already has fruit hanging, I remind myself the plants I grow will produce tastier fruit than any of those hybrids. The first big crop of tomatoes at Heart & Sole was planted in 2008. Richard and I were proud of the Big Boys, Better Boys and Romas that grew tall and became loaded with fruit, but we were devastated when late spring rains came and the plants developed late blight. Within days, almost all plants were affected. Although no tomato plant (or potato) is immune to blights, after our experience, we decided to grow only heirloom varieties, started from seed, in our gardens. Our daughter, Kate, a self-professed tomato connoisseur, was suspicious of the various colors, shapes and sizes we planned to grow in 2009. She asked that we plant “lots of those big red beefsteaks,” because they were her favorites. I found an heirloom beefsteak variety and we did include plenty of those, along with intriguing new ones. 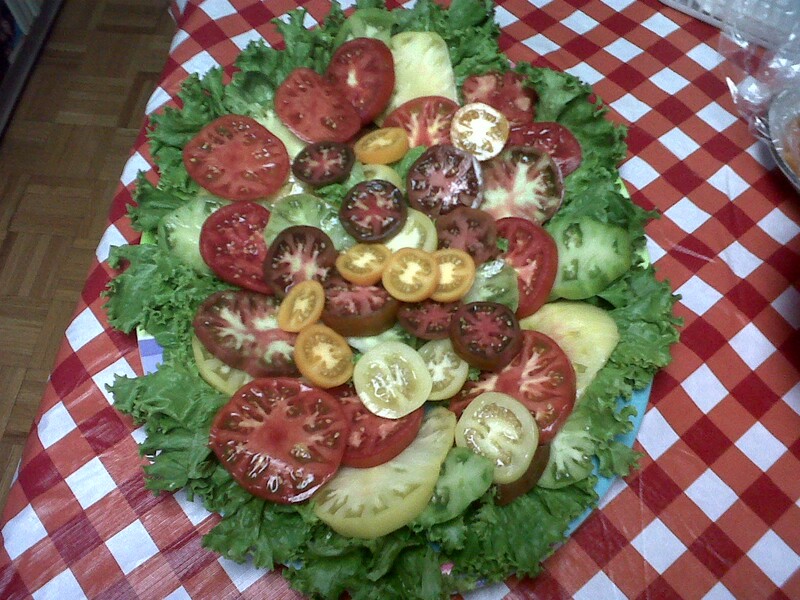 At the height of tomato season, we covered a huge platter with tomato slices and conducted a “taste test” lunch. The only slices that were uneaten were red beefsteaks and Kate had to admit they were no longer her favorite! Platter of sliced heirloom tomatoes. A delicious luncheon taste-testing treat! 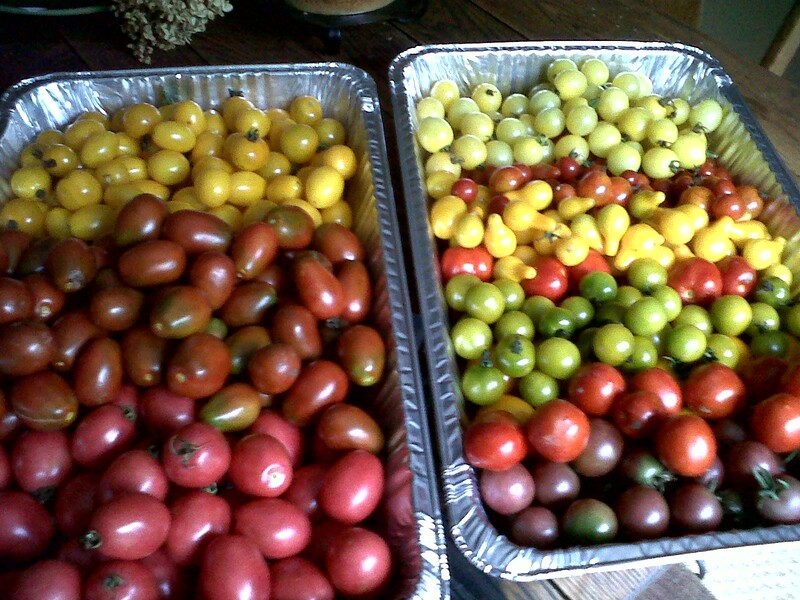 After growing over ninety varieties of heirloom tomatoes, I am often asked which tomato is my favorite. The answer: each one is a favorite for different reasons. 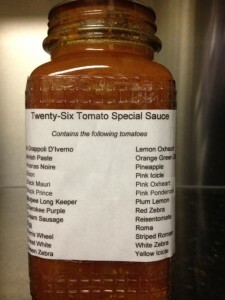 Cream Sausage, a white paste tomato, is best for canning and making white tomato bisque soup. Amish Paste and Japanese Plum are best for fresh salsa. Great Whites, with their huge size and slightly garlic flavor, are perfect for sandwiches. Green Zebras’ salt content makes them the best choice for eating fresh, without added salt. Red, Yellow and Ivory Pear, Black Cherry, Snowberry, Isis Candy and Fox Cherry make a beautifully colored addition to salads or pies. A. Grappoli D’Iverno and Principe Borghese are best for drying. Reisetomate, with a strange brain-like shape, is a great conversation food and who could possibly resist tiny Sungold, eaten fresh off the vine? During the next few weeks, I plan to post notes about the various tomatoes we have grown at Heart & Sole Gardens. Please remember that my notes are subjective and reflect opinions about tomato varieties’ productivity during particular seasons and growing conditions. I encourage any gardener to plant a variety of heirloom tomato types and taste the fruits of each. Taste is a personal prerogative and each individual needs to decide which varieties best suit a gardener’s needs and desires. Undoubtedly, there can be no more satisfying “taste test” than a platter full of heirloom tomato slices, so enjoy the process! This entry was posted in Heirloom Seeds on May 11, 2013 by cindybarlowe.